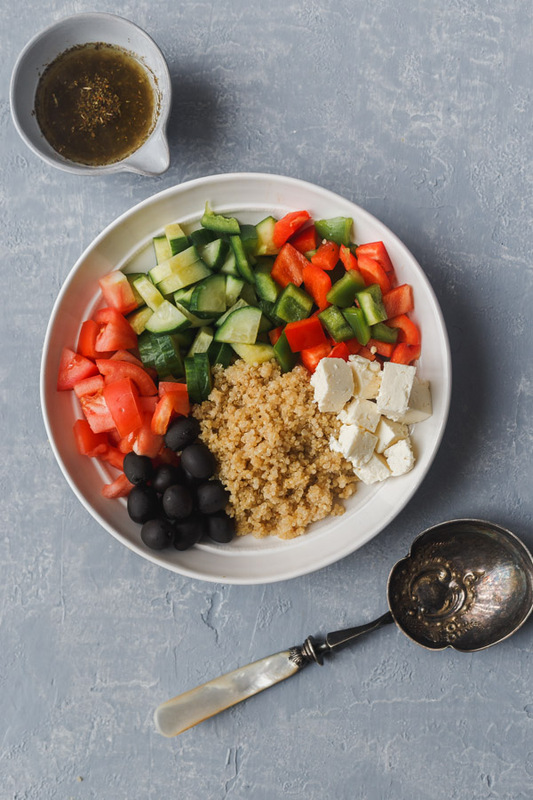 This easy Mediterranean quinoa salad from pantry staples is hearty and healthy and should be in your weekly salad rotation. It takes only minutes to toss this together and will be great on it’s own or as a side dish. We are in the middle of a severe cold spell here in Ontario and we’ve been cooped up in the warmth of the house for a couple of days. 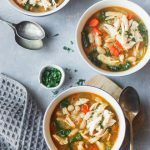 I like to have soups for dinner and something light yet filling for lunch. 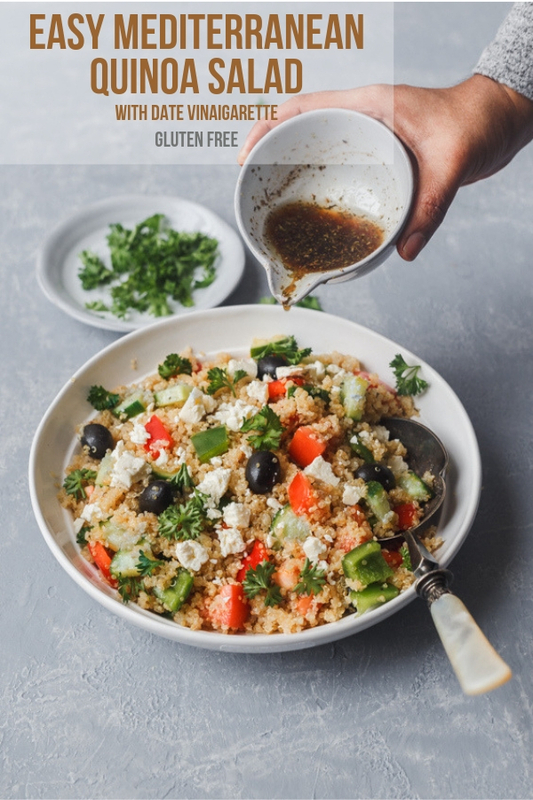 I’ve been making a big bowl of this quinoa salad and having it for lunch pretty much everyday. This salad reminds me of summer and I like to have a bit of summer in these bitter cold months. 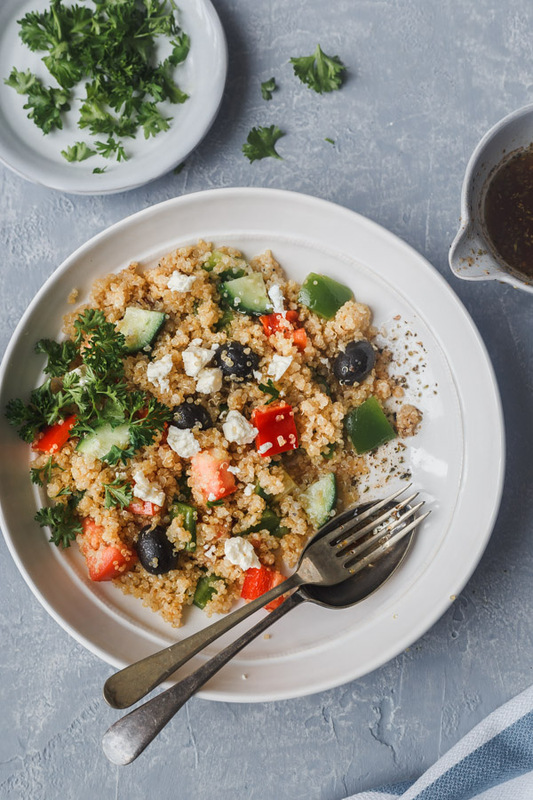 Having said that, this quinoa salad is great any time of the year! Mediterranean recipes are generally healthy with plenty of vegetables and healthy fats for good health and longevity. A quick look at the recently released Canada’s food guide promotes healthy eating with half of the plate dedicated to vegetables and fruits. It’s a significant step in the right direction. I love eating this way full of color and flavor. 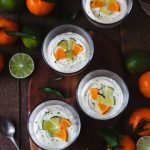 Want to check my other Mediterranean inspired recipes? 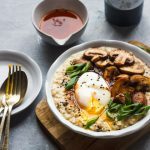 I have a mediterranean inspired savory oatmeal bowl here. 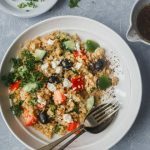 It’s made from pantry staples like quinoa, tomatoes, peppers, olives, cucumber, feta and parsley. Quinoa is super easy to make. It’s filling yet light. Great for lunch or dinner on it’s own. Add some chickpeas for more protein. I can serve it alongside chicken or fish. If what puts you off from making this salad is cooking quinoa, don’t worry, I got you covered. 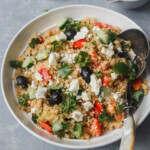 Quinoa is super simple to make once you know the correct technique. I use organic white quinoa. Here’s how I cook it. Place the quinoa on a strainer and rinse under running water rubbing the quinoa with your hands. This is to remove the bitter saponins that’ll make you throw the cooked quinoa to the bin. Tip the quinoa to the pot, add water and give a good stir and drain that water. Now add 2 cups of water to every cup of quinoa. I use half chicken stock and half water to give more flavor. Add salt and let the quinoa come to a rolling boil. Turn the heat to a simmer, cover and cook for 15 minutes or until the water is absorbed. Take off the heat and fluff the quinoa with a fork. Easy as that. Let it cool. Add the salad ingredients and the vinaigarette. Let the flavors meld for 10 to 15 minutes and you have a flavorful salad. I almost forgot to talk about this new kid on the block. I recently came across date vinegar and absolutely love it. 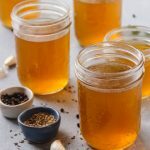 It’s a great alternative to balsamic vinegar or red wine vinegar for those of us who can’t have them. It’s a bit mild so I used 2 tablespoons of it. But you can use balsamic vinegar or red wine vinegar. I suggest starting from 1 tbsp and increasing gradually. I made a classic vinaigarette using the date vinegar but adding dried oregano and basil for that earthy Mediterranean flavors. If you make any of my recipes,tag me #loveandotherspices on Instagram and follow me on Pinterest to get more delicious healthy meal ideas. 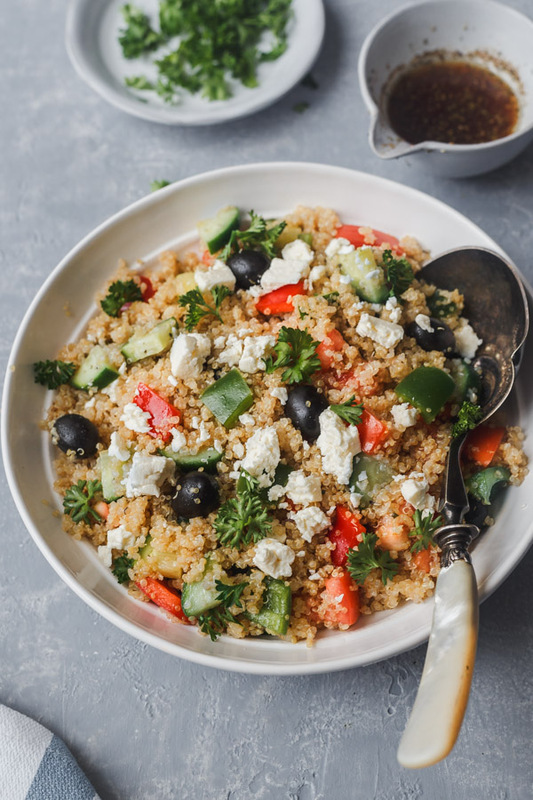 Easy Mediterranean quinoa salad from pantry staples is hearty and healthy and should be in your weekly salad rotation. Rinse the quinoa under running water rubbing it with your hands. Tip the quinoa to the cooking pot, add water( or water and chicken stock) and salt. Bring the quinoa to boil, reduce the heat to simmer, cover and cook for 15 minutes until all the water has absorbed. Take the pot off the fire and fluff the quinoa with a fork. Keep aside to cool. Add all the ingredients of the vinagarette in a bowl and whisk until combined. To a mixing bowl add quinoa, salad ingredients and the vinaigarette and mix until combined. Let it sit for 10 to 15 minutes for the flavors to meld. Best had on the same day. Can be refrigerated for upto 2 days. More than that the vegetables become soggy.